I spent a March long weekend in Joburg where a fair bit of eating happened in the restaurants and cafes of Parkhurst, Parktown North and Craighall Park. Joburg geography leaves me completely confused, so driving is only possible if others steer the wheel, or I have a human GPS directing me left or straight around the inner suburbs’ many traffic circles. Being married to a guy who grew up in Joburg has its advantages at times like this. While we only scratched the surface of eateries (hence I’m not naming venues), a foodie friend pointed me in the direction of some solid restaurants. After trying two cafes for brunch, and having dinner at two neighbourhood restaurants and one fine dining spot I observed the following: owner-run Joburg café food quality and creativity matches the high calibre experienced in similar Cape venues that offer home bakes and take the trouble to prepare food from scratch. Priced about the same. I enjoyed the vibe but as a rule the Joburg restaurant dinners weren’t very exciting, whether we were eating Indian or Italian. Menu prices equalled those of Cape Town. A single fine dining experience of a celebrated rural Gauteng restaurant’s six-course dinner tasting menu was downright disappointing. The price tag was better than Cape tasting menus and wine pairings matched well, but the menu lacked innovation, the plates missing a sparkle. Comparatively, tasting menu lunches or dinners I experienced during the past month in the Cape at Overture and The Greenhouse restaurants were really a step up. I’m not saying this because I live in the Cape. But the proximity of good chefs in Cape Town, Stellenbosch, Constantia and Franschhoek surely plays a role in keeping the competition on their toes. A country supply of excellent ingredients helps too. Anybody who tasted the quality, technically complex fare from restaurant stalls at the recent Taste of Cape Town festival (Taste of CT) will surely agree with me. I was particularly impressed by the savoury dishes from Margot and Neil at Le Quartier Français and Bread & Wine’s joint stall. Savoury or sweet items sampled from Overture, Jardine, Reuben’s, Maze at Gordon Ramsay (their rice pudding was heavenly) and the Cape Colony were all deliciously clever too. On that upbeat note, Terroir at Kleine Zalze only offers a tasting menu on request, but they have just launched a Green Season menu that represents great value. I was invited to sample a few dishes from the two or three-course options as they will change over the winter months. I’m happy to report that chef Michael Broughton hasn’t lost his touch, and winter should be a very good time for locals to fill a Terroir table with family or friends. 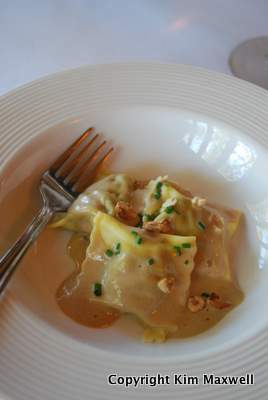 Michael has always made great fresh pasta, so look out for his gorgonzola gnocchi with roasted walnuts, baked butternut and fried sage, or the equally delicious confit duck agnolotti ravioli served unusually with braised Savoy cabbage and a light hazelnut cream. Main courses might include miso-glazed linefish (a delicious combo with sweet and sour aubergine, confit potato and brown yuzu butter) or a vegetarian option that appeals to eye and palate - a tomato tart with Parmesan foam, basil butter, roasted aubergine and confit garlic. TERROIR at Kleine Zalze, Stellenbosch. Tel 021 880 8167 terroir Green Season menu runs from April to end September. Two courses at R165pp, three courses at R195pp. Lunch or dinner daily except Sundays.